*3 packets of ‘White Wings’ brand Rich Chocolate Cake (or similar – but not mud cake because melting chocolate over a saucepan of water etc is not for cheats). These packets required adding softened butter and 2 eggs each – so 6 eggs all together. *1 Betty Crocker brand Milk Chocolate Frosting. I love this stuff, and use it even when I’m not cheating. *Various packets of chocolates. 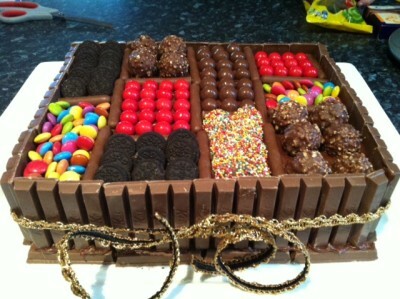 I used: Freckles, Ferrero Rochers, Jaffas, Miniature Oreo Cookies (again, cheaper in the multi packs), Smarties or M&M’s, Maltesers and Chocolate Finger buscuits. I used a rectangular cake tin 22cm x 28cm and 7cm deep. 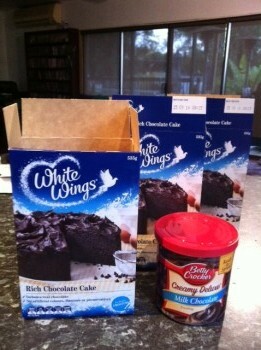 Grease and line the tin with baking paper, set your oven to the instructions on your cake mix. Make and bake cake as directed – allowing for extra baking time because you’re using 3 cake mixes. Mine took almost 2 hours to bake. Allow cake to cool COMPLETELY on wire rack. Seriously, give it an hour or two or you’ll regret it later when all your chocolate decorations fall off. Trim the top of your cake so it’s perfectly flat. Smother the whole thing with the chocolate frosting. Using a little extra frosting for glue, surround the outside of your cake with Kit Kats as a border. Use the ribbon to tie around the Kit Kats, not only does this give the cake a little bit of extra wow, but it helps keeps those suckers from falling off! Use the chocolate finger biscuits to divide up sections – making sure each section is wide enough for whatever you decide to put in them eg: I measured using the Ferrero Rochers and the Oreos. Fill your sections with plenty of yummy chocolate goodness, bearing in mind contrasting colours etc. That’s it. Done. So easy, so quick (except for baking time). And such a show-stopper!